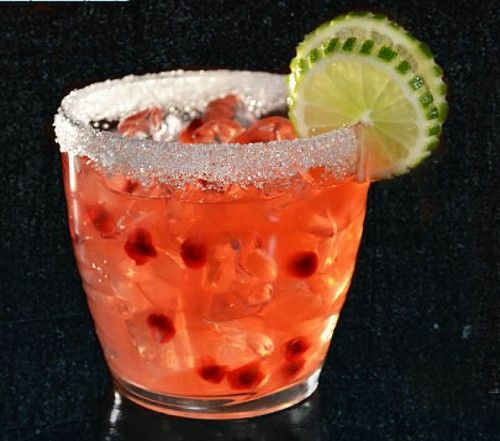 The Pomegranate Passion cocktail adds pomegranate juice to the traditional margarita flavors of lime and orange. The dominant flavor here is a tart berry. This is a very refreshing drink, a wonderful pick-me-up for mid-afternoon. It’s great in warm weather, but on cold days it can make you feel like you’re someplace much sunnier. Fill a cocktail shaker with ice and add everything but the salt in, and shake well. Rim a glass with salt, and put a few ice cubes in it. Strain the mixture from the cocktail shaker into it. Garnish with lime wheels.